One of the central design decisions you make regarding kitchens is what type of cabinets you’ll get and where they will go. 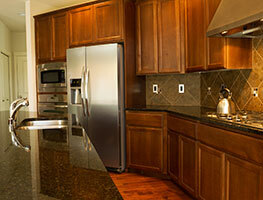 When buying cabinets, you should keep a few elements in mind that will give you the best outcome. We’d like to share some tips about finding cabinets to go in your home that will be customized and will keep you happy for years to come. You will want to get exact dimensions for the space in your kitchen where your new cabinets will go. Get a tape measure and find the precise height, width, and depth of the area where you’ll install them. Of course, if you are happy with previous cabinet placement, you can just measure the ones you have and plan on installing them in the same area. You can experiment with alternative ways to put in your cabinets to get more storage space out of your kitchen. If you are finding that you are tight on places to store your pots or cutlery, you can also think about putting in an island with cabinets. You can draw up a plan to scale if you are having issues visualizing the way that your kitchen will turn out, or hire an interior designer to create exact plans for you. The central aspect of the appearance of cabinets is the type of wood they are constructed out of and what type of stain or finish has been applied. Woods can be a variety of colors and have less- or more-noticeable grain patterns. You can get eco-friendly wood by choosing varieties that have been especially grown and felled in accordance with environmental standards. Bamboo is an especially sustainable wood because it grows so quickly. Walnut and mahogany are two examples of dark, lustrous woods, while pine and birch are lighter and give off a more cheerful look. Stains and finishes will give the cabinet wood matte or shiny appearances. These seal the wood to protect against water damage and natural drying. Wood still dries over time and you can use oils, like lemon or linseed to polish your cabinets and keep them in healthy, great condition. When buying cabinets to go in your home, you will also need to decide if you want any carving or extras. These can really make a kitchen unique and stand out. Choosing ornate knobs or glass panels for the front, for example, can give the space an extra touch that will make your home that much more inviting and special.